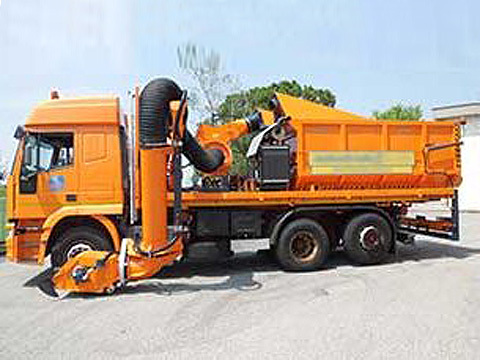 Bush cutters for cutting and simultaneously collecting the cut material, leaves and other debris on the ground, automatically loading everything in a purpose built container that is either towed or integrated on the frame of the vehicle. They are ideal for every situation where it is not permitted to leave grass cuttings on the ground or the road for safety reasons (eg. fire prevention) and/or environmental reasons. They can be mounted on the rear hoist of tractors with a three-point hitch or on an integrated support frame or on trucks with a custom built hook lift frame. 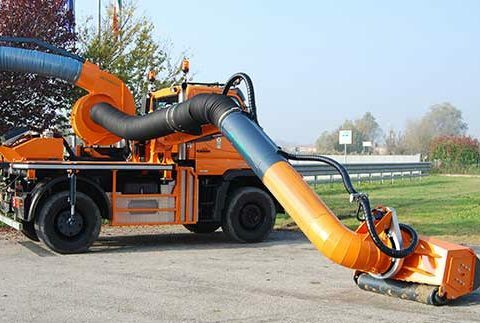 The type of device that carries out the collection can be with a turbine suction unit (the material is sucked up via a vortex of air generated by a fan) or with an integrated conveyor system on the collection trailer (the material is sucked up by the vacuum created inside the trailer). The various models differ, as well as by the type of mounting on the carrying vehicle, by the extension of the arm which, on request and with a suitable vehicle, can exceed standard models by more than 8 metres. It is also possible to create smaller structures suitable for vehicles of a modest size. 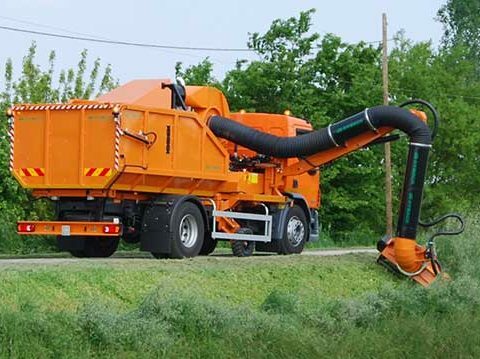 The telescopic system of the arm and the suction pipe allows you to cut close-up and compact closing when moving on the road. The structures, designed to withstand the stresses during the lifecycle of the arm, are made out of high-strength steel. The fundamental elements of the joints, bushings and bolts are made out of steel that has undergone hardening and grinding treatment that increases its strength and optimises its functionality, thus lengthening its lifespan. The jacks, equipped with control valves, guarantee excellent manoeuvrability. 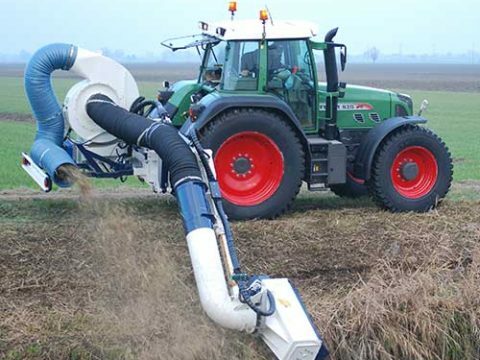 It is possible to transform the machine, temporarily or permanently, for cutting work only, excluding the suction, by substituting the end part of the arm and the head. They can be custom built, modifying both the structure and the system, according to the user’s requirements.